Thornbury Castle is a hotel steeped in history, with impressive Tudor décor, a renowned restaurant and its own a vineyard. This extraordinary Tudor castle is set on the edge of the Cotswolds, with manicured lawns and landscaped grounds. Our members can enjoy a Deluxe Bedchamber with Half Board dining this winter or spring. Thornbury Castle is the perfect base for days out in Gloucestershire, taking in nearby Thornbury (11 minutes away), Bristol (15 miles away) and Gloucester (40 minutes away). From here, immerse yourself in local history, head into the city or explore the surrounding countryside. While the castle is very much the dominant character in the market town of Thornbury, there is plenty to see and do beyond its gates. History buffs will enjoy discovering the background of the town: helpful staff will point you in the direction of its heritage trail, where you can learn about the human activity in the Neolithic and Bronze Age periods. The Romans were in the area, too – in 2004, while digging a pond, a local resident discovered a horde of 11,000 Roman coins. Once you’ve satisfied your historical interest, why not get out and stretch those legs? One of the perennial favourite walks is a meander through the town of Thornbury, taking in the High Street and ambling along the banks of the stream. Slightly further afield is the magnificent National Arboretum of Westonbirt. With over 14,000 labelled trees, workshops and guided walks, this can provide a fantastic learning experience for both adults and children. It’s also a superb location for a serious hike (there are 17 miles of trails), or a peaceful, relaxing stroll through a leafy wonderland. If you’ve always wanted to stay in a castle, look no further. Thornbury Castle, once owned by Henry VIII, has stood firm through many of history’s most pivotal and dramatic events. 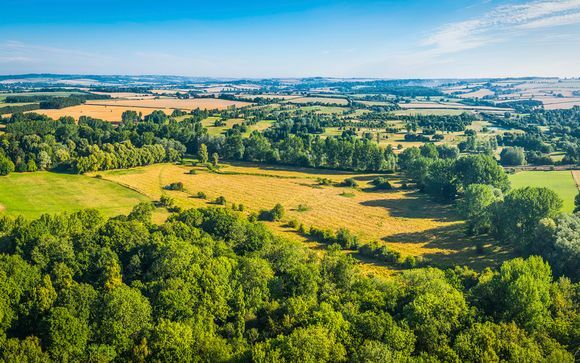 Today, its surroundings are a little more peaceful: nestled in the leafy landscape of South Gloucestershire, it offers a luxurious step back in time from the hustle and bustle of modern life. Outdoors, there are a variety of activities to conjure up the atmosphere of Tudor England. Play croquet on the lawn or have a go at archery. Wonder at the unique opportunity to stay in a real castle, while enjoying top quality food, drink, and spa treatments. This offer is based on a Deluxe Bedchamber. 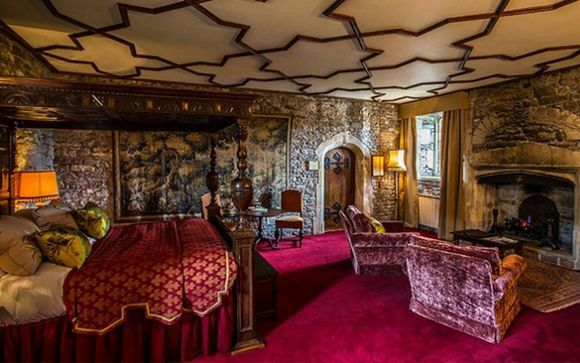 These unique bedchambers include features such as four-poster beds, with exposed stone walls in the North Wing, and majestically wallpapered in the South. Deep-set arrow-slit windows or original leaded windows add to the atmosphere. Each of the 26 bedchambers is unique but still focussing attention on historical detail, the designers have not skimped on contemporary luxuries. The rooms are far warmer than they would have been in Henry VIII’s time, and the bathrooms are both opulent and well-appointed. This offer is based on a Half Board stay (daily breakfast and a 2 course meal each evening -excludes drinks). Relax and enjoy a taste of history in one of the four dining rooms – each with its own character and opulent décor –Let attentive waiting staff take care of your evening, serving a delectable range of traditional fare or more contemporary cuisine with an international flavour. Pick up the wine menu, and the expert sommelier can help you select exclusive vintages from the cellars or the finest of New World wines. For hundreds of years, the kitchen garden has provided much of the food used at Thornbury Castle, and under the enthusiastic skills of head gardener and groundskeeper Jon and his team, the vegetables, edible flowers and seasonal fruit used by our chefs are just about as fresh and flavoursome as you can get. Head chef Andrew Chan knows that selecting the best ingredients is vital to creating the most mouthwatering dishes. He uses grass-fed lambs from local suppliers who nurture their flock like family pets, and gets first dibs on the venison and grouse from nearby Everleigh Farm. Another favourite is rhubarb grown in a shed under candlelight, which is then slowly poached in orange juice, basil, cardamom and cinnamon for a delightful fragrant addition to soups, crumbles and sorbets. History is as infused in the kitchens as it is in the entire castle: Thornbury has a dazzling food heritage, particularly since the ‘70s, where it became the place for international stars such as Sophia Loren and Laurence Olivier to wine and dine in salubrious style. Senior Waiter Pepe Gomes Rivas, now aged 68, tells great tales of the extravagant parties and visiting celebrities, in an era when head chef Kenneth Bell became the first chef outside of France to earn a Michelin star. Leave at Junction 16 taking the A38 north for approximately six miles. At the 3rd set of traffic lights next to the Alveston House Hotel and Berkeley Motors, turn left taking the B4061 into Thornbury. Follow the B4061 down the hill, over the mini roundabout and through Thornbury High Street. Bear left by the National Westminster Bank onto Castle Street – there is a monumental water pump in the middle of the road. At the bottom of Castle Street you will see the entrance gates for Thornbury Castle on the left-hand side of St Mary’s Church. Leave at Junction 20 taking the M5 south on slip road (keep left) – Thornbury will be seen on the signpost. Take the A38 north for approximately six miles. At the 3rd set of traffic lights next to the Alveston House Hotel and Berkeley Motors, turn left taking the B4061 into Thornbury. Follow the B4061 down the hill, over the mini roundabout and through Thornbury High Street. Bear left by the National Westminster Bank onto Castle Street – there is a monumental water pump in the middle of the road. At the bottom of Castle Street you will see the entrance gates for Thornbury Castle on the left-hand side of St Mary’s Church. Leave at Junction 1 following the signs for Thornbury for approximately six miles until you see The Ship Hotel in front of you. Turn left onto the B4061 into Thornbury. Follow the B4061 down the hill, over the mini roundabout and through Thornbury High Street. Bear left by the National Westminster Bank onto Castle Street – there is a monumental water pump in the middle of the road. At the bottom of Castle Street you will see the entrance gates for Thornbury Castle on the left-hand side of St Mary’s Church. Leave at Junction 14 taking the A38 south for approximately two miles. Turn right onto the B4061 into Thornbury. Continue on the B4061 and turn right after the Anchor Inn into Whitfield Road. This leads into Park Road and then just past St Mary’s Church you will find the entrance gates to Thornbury Castle on the right. From London Paddington to Bristol Parkway – a journey of approximately 1 hour 20 minutes. There are taxis outside the station and the journey to Thornbury Castle will take approximately 20 minutes.